After the Guatemalan armed conflict (1960 – 1996), demobilized combatants needed to reintegrate into civilian society in order to create new lives suited to times of peace. One group of former guerrillas, who had spent the better part of their lives in the mountains fighting for their ideals and hopes of a brighter future, decided to reinvent themselves as coffee producers. 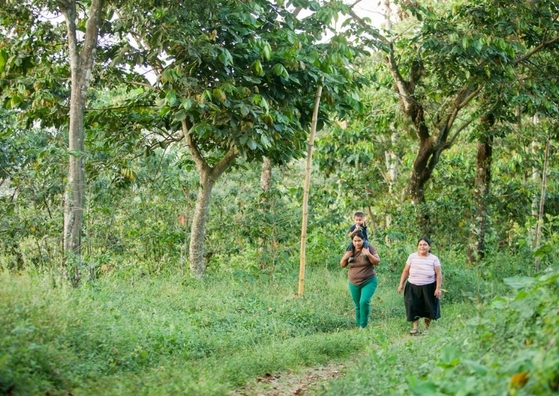 With a government loan, they purchased an old coffee farm and set about building a new life centered around coffee. There was much to learn – few knew about coffee farming, and so with their characteristics zeal for learning and teamwork, members of Santa Anita dedicated themselves to figuring out everything they needed to know about growing, processing, and selling coffee. For a number of years the community flourished. With generous international support they built infrastructure and found buyers, and had a healthy coffee business that provided income to make payments on their mortgage and support their families. Life as coffee farmers, it turned out, was hard work but another way to live out their revolutionary dreams. As has happened with many coffee cooperatives in Guatemala and elsewhere, sadly, success did not last forever. First came internal divisions, disagreement over the direction of the community that made it more difficult to work together around a united strategy. Then the natural disaster of roya (coffee leaf rust) struck, wiping out the majority of their plants. Suddenly, coffee was not a source of hope but an economic disaster. De la Gente has known Santa Anita for a number of years, and our work with them picked up during the roya crisis, when they faced organizational and agricultural challenges. Our work initially focused on rebuilding after roya, addressing the severe damage to plants. De la Gente, with support from the LATA Foundation, funded a nursery to get new plants back in the ground, and provided training and materials for treating roya to keep the new plants healthy. Santa Anita also has a history welcoming people from all over the world, and we began integrating the community into our community tourism program through select service learning trips. A few times a year, students participating in our travel programs visit Santa Anita, spending a few days staying with the community, learning about their history, and exploring coffee together. This provides a secondary source of income as well as an opportunity to tell the world about their story. This year, with support from our the Sanibel-Captiva Rotary Club, which has generously supported De la Gente’s expansion, we were able to integrate Santa Anita into our coffee commercialization program, providing market access and better income through exporting coffee. De la Gente signed a contract with Santa Anita for a small lot of coffee, which we purchased and imported to the US. The coffee was snatched up by two roasters and is now available to all our coffee drinkers as part of our Los Nuevos Coffee Bundle, or in the La Colección Coffee Bundle where you can sample all four coffees we are offering this year. We plan to build on this year’s experience, purchasing more coffee for the coming harvest and continuing to reinforce best practices for coffee cultivation and quality production. We hope you’ll join us by drinking Santa Anita coffee, supporting our programs, and being part of the De la Gente family.